Probably the most dreaded time for most woodworkers involves the glue bottle and cramps and clamps. Making decorative small boxes is no different and just because they may be diminutive compared to a chair frame or cabinet, it is no less a struggle to get everything done before it's too late. 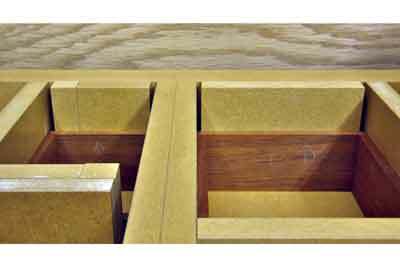 This simple jig takes almost all the stress from this final stage in assembling the components of a basic square or rectangular box: the four sides, a top and bottom. 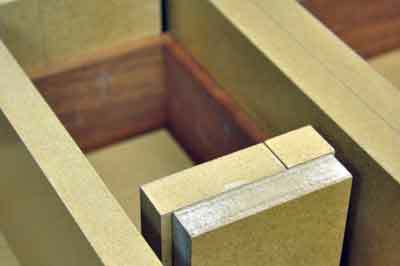 The main photo shows how the jig is used in practice although the two box carcasses you can see have not been routed for the top or bottom to be fitted, thus allowing a clearer view of what is going on. I wouldn't normally try to glue up two different sizes but with a little extra thought and care you can. You may be thinking you don't make boxes so this is of no interest. This jig can have many uses; it's up to you what it helps with. If you hadn't thought of making decorative boxes, then there are various people around who can teach you and I can personally recommend Andrew Crawford. The theory behind this simple and incredibly useful jig is the meeting of three planes. 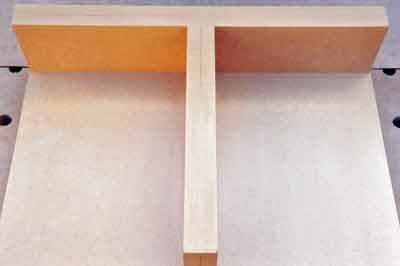 We have a flat baseboard with a 'T' piece attached. The key to success is that the 'T' has accurate 90° corners where the two parts meet and then the 'T' components are both also at 90° to the baseboard: the only angles you can measure on my jig are 90°. I've used several and this latest one is heavy and solid and used for more than just gluing. The dimensions are up to you but as a guide, mine will easily take two box carcasses at the same time that are 100mm deep and 200-300mm in plan, or slightly larger with an additional MDF sub-base. The jig is constructed entirely from 18mm MDF. The sheet used was left for some time in the workshop to acclimatise and the finished jig would rarely leave that environment. We are told how stable MDF is, but why risk movement? I checked the board was flat, i.e. not bowed, and also smooth - we don't want impressions left in our boxes by imperfections in the surface. After deciding on sizes, begin by cutting the two pieces to make up the base. I glued these together using biscuits, having checked both were flat. I didn't cramp or clamp them together; I placed them on a known flat surface and weighted evenly a further flat board. Once cured, I trimmed all four sides smooth, ensuring they were at 90° to each other; I used my shooting board for this as I wanted to know that every edge and corner was a right angle so I can use any as a reference. The top surface was then lightly sanded with 180 grit abrasive to ensure there were no tiny projections that might later affect delicate surfaces. Next, glue the pieces together that make up the top and stem of the 'T'. Again, I then ensured all edges and sides were 90° and I sanded what would become the inner surfaces of the two assembled 'T' components for the reason above. It was then time to make up the 'T' itself, done in two stages. The first job was to secure the top of the 'T' to the base and biscuits were used again. During the gluing of this, I wanted to ensure the vertical surface of the section was as accurate a right angle to the base as possible. After much checking, it was left to cure before stage two. Fitting the stem of the 'T' in place was next and again lots of checking was done before leaving to cure. I did not use biscuits here as I preferred to wait until the glue had gone off properly before adding mechanical security. To prevent movement, I resorted to Miller stepped dowels from underneath into the 'T' stem to prevent sideways movement and through the top of the 'T' into the stem to hold them at the accurate 90° I had achieved. Using these dowels allowed me to lock the components together with minimum chance of anything moving. 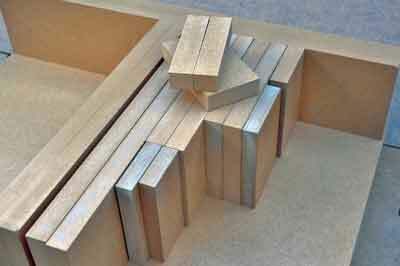 Any minor error in the internal angles between base and 'T' section will always be transferred to your workpiece. Don't use your 30-year-old Marples try square for setting out and checking unless you have carefully checked it is still accurate. I have one large Moore and Wright engineer's square - see F&C 201 for a review - which I use as a reference to check other squares and instruments. You don't have to go this far; just check whatever you are using with the edge trick. Have a piece of board with a straightedge and scribe a line with the square. If you flip the square over so the stock now points the other way along the edge, then the square edge should still line up with your marked line. If it doesn't, then you will not have an accurate jig. It is also a good idea to check that both the inner and outer edges of a try square blade are straight, parallel and both at 90° to the stock - not guaranteed even with a new one! After checking all angles again, I carefully removed any glue squeeze-out and after a thorough removal of dust, began to apply four coats of satin acrylic lacquer. 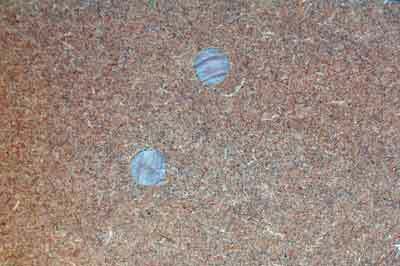 The three key surfaces were lightly sanded between each coat to avoid tiny lumps that may cause damage in use. 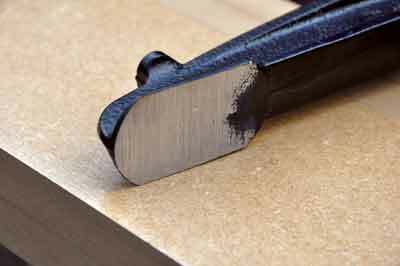 A good impervious coating will ensure that any glue coming from box joints is easy to remove and, in practice, this is the case. I did exactly the same to all the spacer blocks. Again, there is little point in giving sizes but my collection now caters for almost any box size up to 200-300mm. There are two critical dimensions for these spacers. All are made the same height as the jig 'T', which makes life so much easier when aligning cramps. Also, any that may be used side-by-side to fill a need - seen in use for the smaller box - must be the same thickness. Do not assume this will be the case as in the past, I have found up to 0.75mm variation in MDF sheet thickness across one board! It is not always the flat and accurate material we all assume. Always carefully clean the basic jig before starting and inspect every spacer block for any damage, especially if you drop one; when dealing with delicate box components a distorted corner could be enough to reintroduce the stress we are trying to avoid! I place the jig on anti-slip matting to avoid the possibility of movement. Always have a dry practice. This allows you to select spacer blocks as necessary and the most appropriate cramps - or clamps - depending on your terminology. I've always worked understanding a clamp secures things together, often permanently, while a cramp pulls things together temporarily such as when gluing - but that's just me. 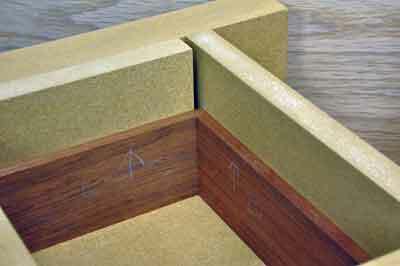 The spacer blocks should be chosen so they place pressure evenly on each component, especially near the joints - in these boxes simple corner rebates. 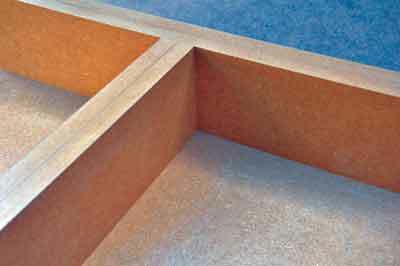 If you make the rebates slightly too deep so the joint can be finished off later, you will need to have one spacer against the 'T'. This needs to be a size that does not interfere with these rebate projections. Using 'F' cramps as shown here, the reason for having all the spacers the same height as the 'T' section becomes clear. The rail of the cramps can rest on these top surfaces and you can use the edges of the baseboard or of the 'T' as further references - of the shorter ones. Using long-reach versions means you can still get the cramp heads down to the centre of the component sides but probably need to have them leaning over if you want support for them. A quick word about the Bahco cramps in the photos: these are well made and incredible value compared to other long-reach ones available. They do suffer from the fixed jaw not being quite perpendicular to the rail, as you find on many makes. I ground these so they are square using the Robert Sorby ProEdge, which was reviewed in F&C 221. I did write at the time that some minor shortcomings as a sharpening system were balanced by other benefits, one being its use as a metal linisher and for this additional task it was perfect. Keep your jig safe, stored flat, clean and damage free. Do the same with your ever growing collection of spacers and the time taken in construction will be repaid many times over. It has other uses too: want to make up a wooden try square? If you were accurate in the making of the jig, this will allow you to glue one up as accurately as you can get. 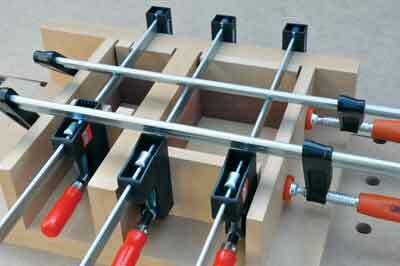 Small drawer assembly is easy and trays to fit in boxes take a matter of minutes. I keep finding tasks it helps with.